The praefectus’ offices on the main Forum? 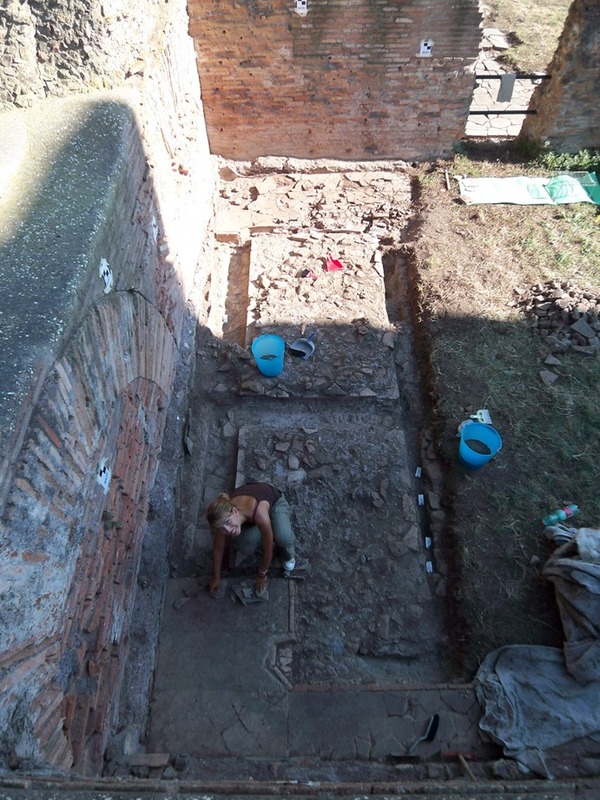 Alex, Kathrin and Axel waited long for the chance to excavate the room in which they had discovered slabs already on the first day of excavation. Axel found a few forgotten plans in the archive showing the limits of old excavations. Though the surrounding walls were previously drawn in the 1920’s, the existence of several big rooms with big openings onto the Forum immediately next to the Capitolium never attracted scientists for proper excavation. Their orientation and size characterizes them as most important official representative spaces. So it was no real surprise to find again a full set of late spolia-pavements buried just under a few centimetres of modern topsoil (pictures). 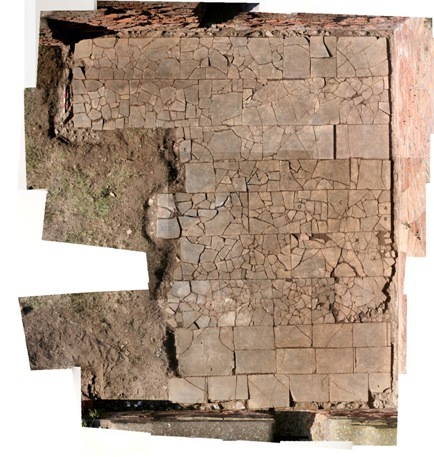 Again there was enough dating evidence for the latest monumental decoration: a second mortar layer is corresponding to the slabs of the fifth century. Also parts of the Roma and Augustus-temple were reused here, like in the south portico. Beside that another fully preserved honorary monument of the Forum was dismantled and cut to deliver nice stone slabs for the pavement. Lots of postholes, marks and three podia were found. The function of the podia in the siderooms remains a mystery though: were these side-rooms used for water-display, statue-galleries or as a late sacellum (sanctuary)? 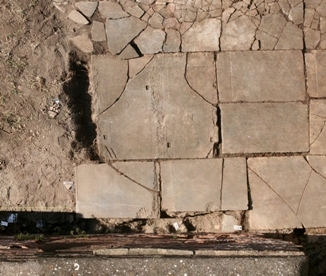 Additionally, the letters ‘n’ and ‘o’ plus lots of geometric graffiti were found on the slabs in the main room. This room had an exclusively late floor, a more than 4m wide open door and could have been used ideally for reception rituals, maybe of the praefectus annonae or other officials. The variety of marble architectural ornaments from walls and floor which have to be classified and dated, deliver enough work for Axel’s team in wintertime.